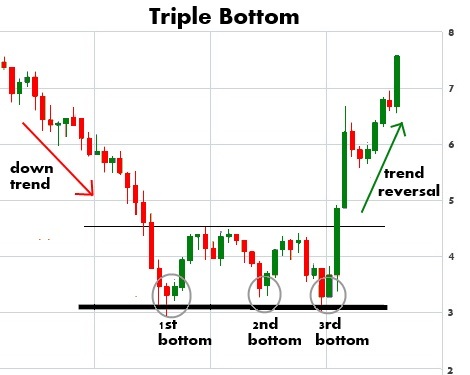 Triple bottom Pattern is very reliable, bullish reversal pattern. It is almost a other variation of our Inverse Head and Shoulders pattern, except Head C is equal to left and right shoulders.The triple bottom price pattern it typically formed in a downtrend being a sign of a following reversal and a rise in prices. It is considered more significant than the double bottom pattern. 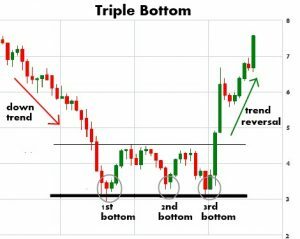 The triple bottom pattern is characterized by three consecutive lows located roughly at the same level and two highs between them. 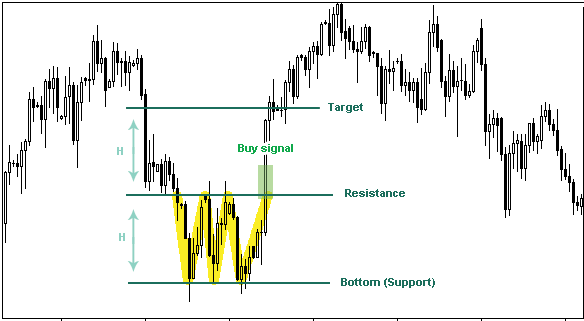 Support and resistance lines connect the lows and the tops respectively. 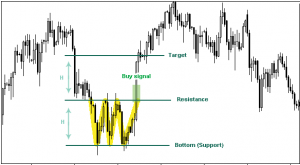 The support is considered to be especially strong as the price reverses three times from the level where investors believe the asset is under priced.If the price climbs above the pattern’s tops or resistance level (plus certain deviation is possible), the formation is then completed and can be interpreted as change in direction of the trend upwards serving as a buy signal.